Cindy Hartline of Love for the Truth Radio, interviews Bill Salus about his book called Nuclear Showdown In Iran, Revealing the Ancient Prophecy of Elam. Iran is presently experiencing a nuclear and spiritual showdown, and they are discussed in this timely interview. The alarming details of an ancient prophecy have recently been revealed! A biblical prophecy that has been vastly overlooked may foretell the future of Iran’s dangerous nuclear program. Bill’s new book exposes what could turn out to be the next major Middle East news headline. Click Here to learn more about Cindy Hartline and Love for the Truth Radio. Below is the actual script that Cindy Hartline provided for the radio interview with Bill Salus. 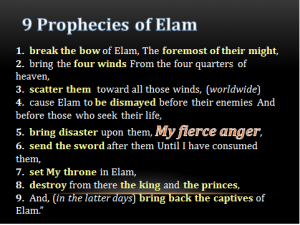 —Our guest today is Bill Salus the author of the Best selling book on Amazon Kindle since July 2014: “Nuclear Showdown in Iran, Revealing the Ancient Prophecy of Elam”..We will be discussing the details of this amazing prophetic book and its message today. —Bill Salus is the founder of Prophecy Depot(deepoe) Ministries. He is an author, researcher, conference speaker, and host of the popular radio program “Prophecy Update” in Southern California. Bill has appeared on numerous radio and TV shows and his articles have been published worldwide on many internet sites like World Net Daily, the Christian Post, & Rapture Ready. —Bill is an expert at explaining the prophetic relevance of current Middle East and world events. He allows prophecy to speak for itself, rather than modernizing it into newspaper exegesis. —Bill Salus’ first book, Isralestine, The Ancient Blueprints of the Future Middle East, rapidly rose to the top of the Amazon best seller’s list. — and Psalm 83, The Missing Prophecy Revealed, How Israel Becomes the Next Mideast Superpower. The Psalm 83 book is the revised upgraded version of Isralestine. —Bill’s latest best selling book on Amazon Kindle“ Nuclear Showdown in Iran, Revealing the Ancient Prophecy of Elam”, again is what we will be discussing today. 1-2) Bill, All eyes “are” on the Middle East right now theres a lot going on there. You say that the message in your book is a“forgotten prophecy” and you believe that it is imminent for our time,… lets start by giving our listeners a “brief” description of your book. 3) Where is this “forgotten prophecy” found in the scriptures? 3a) I understand that there is a prophecy in Ezekiel 38-39 that some may confuse with Jer. 49 We know that Ezekiel and Jeremiah were contemporaries, however, their prophecies were not the same…. Bill, can you explain the difference between the two? 4) Where will this “hidden prophecy” take place (precisely)? 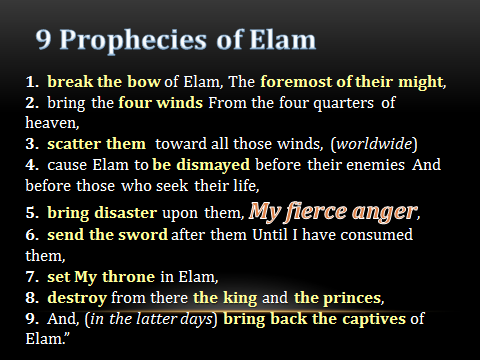 2) We know now that Elam is Iran, what “will” take place in Iran? 3) This prophecy will indeed affect Nations worldwide. Whose mostly concerned about Iran’s Nuclear program? 1) Why is God judging Iran/Elam? 2) In Jer. its clear that God has a fierce anger towards Iran and will bring forth judgement.. What are the “I wills” that God will do to Iran? Isaiah 22:1-6 excellent hunters archers. 1) Bill in Jeremiah we read that Elam/Iran will be dismayed and a Worldwide dispersion of the Iranians will occur… can you explain? 2) The Lord will establish his throne in Iran?? 2 places: Iran and Jerusalem ? 3) Though Judgement is upon Iran… God has a love for the people there.. What is God doing in Iran now? 4) Bill, our listeners heard the Warning what advice can you give to American Christians?